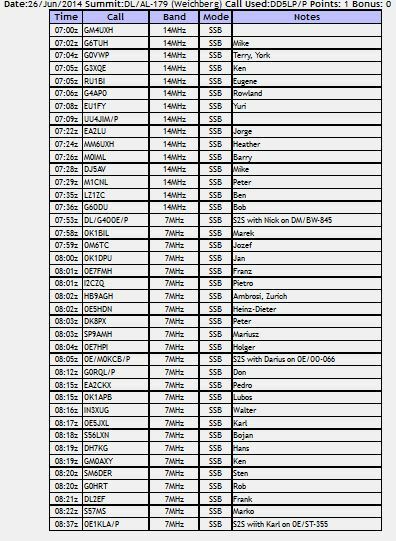 With the intention of catching some S2S contacts with SOTA activators on their way to the HAM RADIO event in Fredrichshafen (or already there). I sought out a summit that I hadn’t activated yet, where I could travel to from home and then return home, before driving myself to Friedrichshafen the next day (Friday 27th. June). Weichberg with its small chapel is very easy to access, in the middle of a farming area that appears to have adapted itself for holidaymakers wanting to hike the local hills with holiday homes, cafes and one souvenir shop in the village of Rettenbach which is at the bottom of the Weichberg hill. There is a car park for about 5 cars and then a short path up through the trees to get to the chapel on the summit. Access is easy. I drove to Weichberg on the preceeding Monday (June 23rd.) to check-out the location and test for radio noise as there is a TV and Radio transmitter mast behind the chapel on the hill. 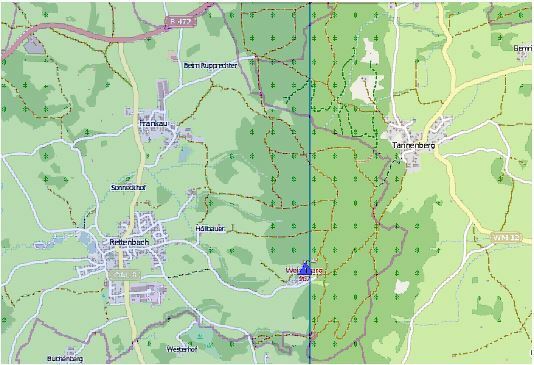 Weichberg is easy to find – take the B472 out of Schongau in the direction of MarktOberdorf and after about 10km Rettenbach is clearly signposted as a turn to the left. After going through the small village of Frankau continue on to the centre of Rettenbach where Weichberg is signposted to the left up a road called Dolce. Follow this road to the point where the road is restricted for forestry worker access only and at this point there is the official (signposted) car park and the start of the track up to the chapel. After walking up the track (it takes about 3 minutes) I did find some RF noise with my portable shortwave receiver but could not say if this is coming from the tower or elsewhere. In any case the level was not bad enough to block out all signals. At the chapel on the top of the hill there is a grassed area with some seating banks, a cross and some small trees. To the north of the grassed area a large forrest starts and to the south, the land drops off quickly to local farm land. This is a good area to set up the station in. The plan was set – bring both bags of the usual equipment. Set up the dipole NE to SW in the hope of perhaps capturing the last of the long path window into VK at the 0730UTC planned start time. Then settle in for some DX and S2S contacts. The activation went to plan, the weather, although starting off foggy cleared en-route. It was warm in the sun, but cold out of it. I set up using the wooden log table and banks and ran the dipole NE-SW (incidendaly end-on to the TV & radio tower a few hundred metres away – I had no problems from the tower). I was hoping perhaps to catch a VK chaser but it seems I was probably a little late for the long path window even though I arrived 30 mins earlier than planned and was operational by 0700 UTC (9am local). After working several chasers on a busy 20m band I switched to 40m and managed to contact Nick DL/G4OOE/P for a summit to summit contact. I also manged two S2S contacts into Austria. With a total of 40 contacts all up, this was a good activation. The site is very easily accessible, so for anyone looking to do a holiday style SOTA activation, this is a nice spot. The views are glorious and the small chapel on the summit is very neat and tidy inside. Quaint without being over done. The door on the chapel has an electric lock, simply press the button to allow the door to be opened. watch your head if you decide to go upstairs, the concrete roof is unforgiving which my wife unfortunately found out. The Second activation – December 4th. Due to being unable to gain access to Eisenberg (DL/AL-171) for an attempt of an S2S into Virginia USA, I decided to re-activate Weichberg as it was on my route home. As the pictures show, it was a cold foggy summit, with ice droping out of the trees and a cold, damp wind. I earned my 3 bonus points for activating in the winter season! Yes that is the coax all messed up – with cold fingers I was unable to untangle it. The S2S with Eric W4EON/P on W4V/SH-015 was successful, so the hardship was, in the end worth it. An easy activation. A pleasant half a day out in the country with a stop for lunch mid-way on the way home. No equipment problems but still hoping to get a roofing filter for the FT817 to improve selectivity when strong signals are on the band. Let’s hope I can find one at a good price at Friedrichshafen. Consider temperatures. A shaded area where the table was seemed a good idea, and it would have been later in the day, however in the morning, when the sun doesn’t get there it can be very cold. I would have been better to set up my two small camping chairs on the grass, nearer to the antenna mast. 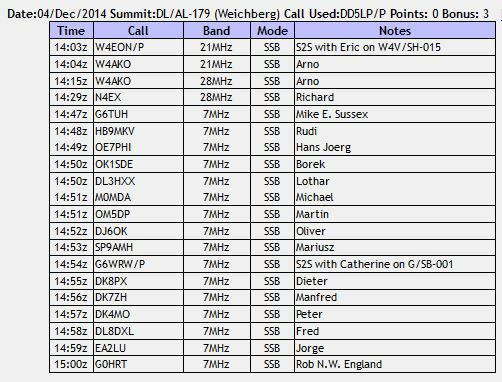 This entry was posted in SOTA and tagged DL/AL-179, SOTA, Weichberg by VK2JI DD5LP G8GLM. Bookmark the permalink.